After medical facility is damaged, hundreds of patients cared for in emergency clinic established by volunteer doctors and nurses. Nurse Birgitte Gundersen and other medical staff mobilize before seeing patients at the East Avenue Church in Chico, where many had evacuated after the Camp Fire in Paradise. Two weeks ago, the residents of Paradise, California, were making plans for Thanksgiving. Now, after the devastating Camp Fire swept through the town, those who survived are now trying to plan the rest of their lives. The blaze killed more than 80 people, and hundreds of people are still missing and unaccounted for. As many across the nation gather for the holiday, more than 35,000 people in Butte County – where the Camp Fire is still burning – are still under evacuation orders. In the midst of all the chaos, residents are coming together in a big way. Inside the walls of the East Avenue Church in Chico, the sanctuary, gym, parking lot, and every other available space, have been turned into a highly organized command center. When the fire damaged Paradise’s main hospital, the Adventist Health Feather River Hospital, a pop-up clinic was established inside the church so that patients could be seen there. One of those working busily to see patients was Birgitte Gundersen, a nurse who lives in Paradise. She and her husband narrowly escaped the flames with their lives, but lost their home in the fire. 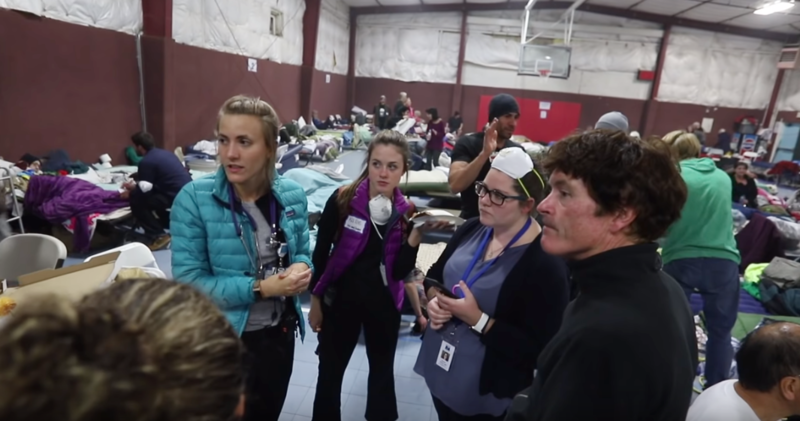 It’s day 14 of operating the medical operations in the shelter, and Gundersen hasn’t taken a day off since the fire swept through, along with the many others working at her side. She estimated she and the team of doctors and nurses assembled at the clinic have seen about 300 patients, with a huge range of medical needs. “It’s like an emergency room,” she said. Gundersen and other Adventist Health staff mobilized to quickly organize operations in the shelter, and now a team of nurses, doctors, medical scribes and runners who retrieve prescription medications from nearby pharmacies are all working to provide 24-hour care to evacuees. Direct Relief medications have allowed staff to have essential medicines on hand, so that the runners don’t have to make as many trips to local pharmacies all over the county, which can take hours. Those efforts are also complicated by the fact that many people don’t have transportation. “Many people literally had their cars melt,” Gundersen said. Recovery for the community will be a long process. Staff at the shelter are prepared to be in operation for the next four weeks, until Christmas. Right now, the concern is keeping up morale, and Gundersen and others were working to put up a wall of pictures of people who have been helped at the shelter. On Wednesday, Direct Relief delivered a $50,000 emergency grant to the Feather River Hospital staff, as well as medical supplies requested for care in the shelter. Tetanus vaccines, respiratory medications, diabetes supplies and other medical aid were delivered to staff there. Direct Relief staff also made deliveries of respiratory supplies to Mangrove Medical Group in Chico, and delivered another emergency grant of $50,000 to AMPLA Health Center, which operates several sites near Paradise. More than a dozen AMPLA staff lost homes during the Camp Fire. On Wednesday, rain was pounding the area, good news for firefighters battling the blaze. The rain could complicate search and rescue efforts, however. About 10,000 sandbags had arrived at the shelter earlier in the day, and locals were bracing for weather. “It’s been a community effort,” she said.